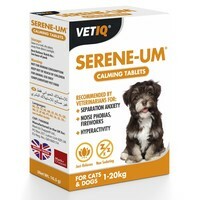 VetIQ Serene-UM Calming Tablets for Cats and Dogs are a natural food supplement to induce calmness and to soothe hyperactive, aggressive and/or nervous cats and dogs. Formulated with natural ingredients, Serene-UM helps your pet to remain calm during periods of stress and anxiety, without having a sedative effect. VetIQ Serene-UM is a tasty highly digestible tablet, which can be given whole or crushed over food. The tablets start working 6-8 hours but for maximum effect allow 24-36 hours. Fresh drinking water should always be available. Each box contains 120 tablets. I have been using this product on my irish red and white setter and ragdoll cat for many years and in both cases have found excellent results, my Setter was very nervous about flying object and fireworks and this product has relaxed her no end, use it on a daily basis on the starting dose then increase the dose at Bonfire Night and New Years Eve time with good results, my cat developed a urinary problem where he would urinate on armchairs or on beds after various tablets from the vets I started giving him one tablet a day and touch wood it has work wonderfully well on these tablets for the past six years, and a lot cheaper than constant vet visits. Wonderful product which does what it says on the box!!! Have used these for a stressy rough collie and they have help enormously... agree with others there will still be up and down but they def. work.. This will not change the character of your dog, but it helps my nervous dog (a rescue) a lot, alongside behavioural training and lots of love, they do make a difference, however, there will always be ups and downs. I was recommended these tablets by a neighbour. They took a few days to really work but I have noticed a difference. I have tried the plug in DAPS but these only work in the area they are plugged in and are very expensive. I needed something that would work when outside on walks or in the garden. I will definetely buy them again. Try zylkene I have found that works for my scatty cat and a new rescue lab. I started using Serene um tablets on my 2 year old scatty labrador. She has been on them a week now, at this stage I'm not sure if they are really working or not as she has some calm days and some manic days depending on the situation. What I am concerned with is since she has been on them she has had some very loose motions. Can anyone tell me if this has happened to their pet. I have only been giving her the stated doseage. This did not work for my dog, DAP worked great and I noticed when it had ran out as my dog started to misbehave again! Buy DAP instead.